In the world of judging a book by its cover, I'll admit, I caved. I was interested in this novel solely because of its cover, and because it was put out by a Canadian press. I find that I enjoy historical fiction from Canada, because it's generally pretty diverse. You know those Little House books everyone loved when they were kids? I was not a fan. I hate, hate, HATED how Laura and Mary referred to the Native folk in the story. I hated how everyone treated them like wild animals that you could throw food to and back away warily. I hated worse the Little House TV series, with the token brown people - ugh. I know it was somewhat accurately depicting a specific place and time, but it wasn't as accessible as it could have been for me. Reader Gut Reaction: This is actually fairly straightforward for a "mystery," and is based on an unsolved murder from the summer of 1866. The novel serves as an introduction to the Cariboo Gold Rush. Now, I'm fairly familiar with the one that happened in California (Hello, SF 49ers, so named for the 1849 rush that happened after the 1848 Sutter's Mill discovery - and YES, Mrs. Wallace, I still remember fourth grade social studies. Gold dust miners = 49ers), and though California's was one of the most written about, quite a few places had gold rushes, including British Columbia. A gold rush was a great place to make money, if you were a.) a store keeper, b.) a launderer, c.) a cook, or d.) a lady of "negotiable affection." If you weren't providing a service to the scores of men who flooded the tent-and-cardboard cities in search of their next claim, you were losing more money than you were making, for the most part. While the gold rush provided the impetus for a mass migration, it was a lot less about gold. It was, sadly, about unscrupulous characters making a ...killing. Which brings us to this murder. Recommended for Fans Of...: My Name is America: The Journal of Wong Ming-Chung by Laurence Yep; Blackwater Creek by Deborah Kent; Letters from the Corrugated Castle, by Joan Blos; By the Great Horn Spoon, Sid Fleishman, and an host of other middle-grade Gold Rush novels. Cover Chatter: As mentioned, I love this cover. An old-timey picture of a person of color, looking tidy, neat, and prosperous is so rare that I can just imagine my fourth-grade self startled and interested, eagerly poring over the book. He even has a proper cane, which Moses has in the book! Detail! It's a beautiful thing. What's also a beautiful thing is that Moses' ethnicity is barely mentioned. He just IS. The photographic cover is not this novel's first cover; the 1988 original is a bit murkier, showing action and not giving a lot of information -- it's actually quite muddy, as I look at it again. I believe it depicts the "Me" of the title, Ted, and the alleged murderer, James Barry, but that could be someone else... This novel, now in its fourth printing, definitely needed an update, and I appreciate this evocative cover. Authorial Asides: What I love the most about this book is that it's actually an after-thought. Ann Walsh ran across a tiny piece of history while researching for a whole other novel. The name of Charles Blessing stuck with her, and she followed clues from his story to recreate this fictional account of how he died. This novel ends... enigmatically, but honestly. I was disquieted by the conclusion, and I suspect young readers will be as well. Good thing there are TWO sequels; THE DOCTOR'S APPRENTICE and BY THE SKIN OF HIS TEETH, both set in the same time period of Gold Rush Barkerville, and both starring young Theodore. A winning social studies triumvirate! 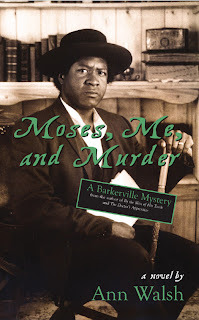 You can find MOSES, ME & MURDER by Ann Walsh, May 25th from Dundurn Press, or at your online independent retailer, or from a Canadian public library. Thank you for a fair, considered and thoughtful review of my book. The cover photo is of an actor who played the role of Moses the barber on the streets of Barkerville, a restored gold rush town and 'walk in' museum, for many years. @ Ann: THANK YOU for writing this book - I really, really enjoyed it, and just love the spin you put on historical fiction. And thanks for the heads-up on the cover model - I'll bet he's even more awesome in person.